Frank Schoonover painted this scene of Pall Mall, Tenn., Alvin York's heroism during World War I. Cleveland, Tenn., businessman and Allen Jones recently purchased it from an out-of-state museum to return it to Tennessee. Photo by Randall Higgins /Times Free Press. CLEVELAND, Tenn. -- A celebrated painting of World War I hero Alvin C. York finally is in his home state -- Tennessee. Local businessman and philanthropist Allan Jones completed the private purchase on Veterans Day. "I was aware of this painting for many years but never thought it would become available," Jones said. York, a native of Pall Mall, Tenn., became famous for his acts of courage in October 1918 in France. As an acting corporal, he led 17 men into battle and was awarded the Medal of Honor. "We are honored that Mr. Jones has brought [the painting] home to Tennessee, which is what Alvin and his family would have wanted," Cleveland Mayor Tom Rowland said during the community's Veterans Day ceremony. 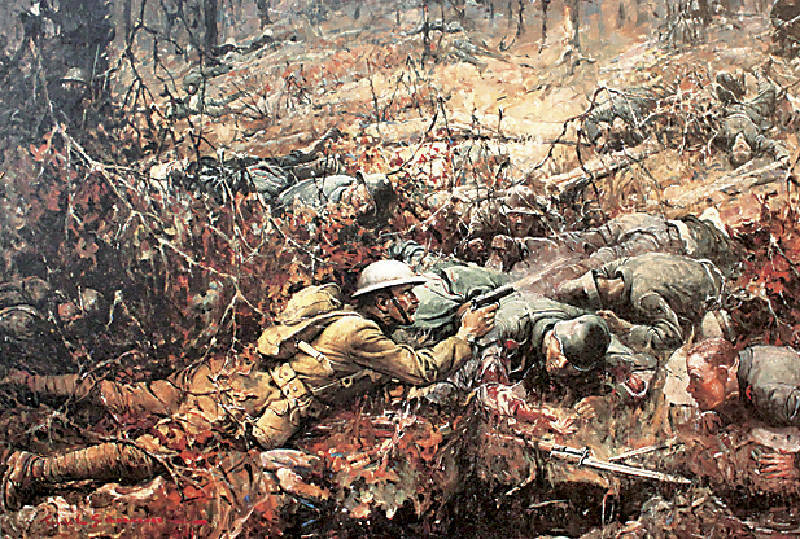 The battle scene was painted in 1919 by artist Frank Schoonover. It was sold to a Delaware collector in 1926 and acquired by Blakeslee Gallery in Wellington, Fla., in 1988. Before Jones acquired it, the painting had been on loan to the 82nd Airborne Division War Memorial Museum. "When I learned that Mr. Blakeslee would consider a sale to the right buyer, I felt it was important to have the painting here on Veterans Day, 11-11-11," Jones said. The painting depicts York, gripping a pistol and firing during the battle of Argonne, surrounded by German soldiers.